Oil painting on linen by Grant McSherry. 1500 mm x 700 mm. I usually spend hours in any landscape that I paint… but I have spent months at Ohope Beach over the years. When I began prepping the linen and really contemplating this oil painting, I fully realised the challenges associated with creating a sense of place about a landscape that I have seen very differently over so many years. Since before I can remember, my family took holidays at Ohope beach and I have memories of early swims and treks over to Shelley Bay. Granddad taught me to fish when I was four at Port Ohope wharf and fishing became the highlight of my holidays from then on. For those first years, we stayed at Mrs Brown’s units on the West end of Ohope Beach. For many summers after that, we enjoyed the best Christmas holidays imaginable in our caravan at Findlay’s / Surf & Sand Motor Camp, situated mid way along the beach. 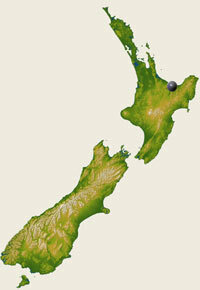 We eventually secured a regular beachfront caravan site, from where we renewed acquaintances with other families from around New Zealand who, like us, migrated to their regular caravan sites annually. My fishing trips to the wharf as a four-year-old progressed to surf casting and then to big game fishing. During my late teens, I would spend my savings each year enjoying the thrill of catching Yellowfin Tuna from the charter boat ‘Caramea,’ which sailed from the Whakatane Heads, just over the hill from Ohope Beach. In my early 20’s I would often run down the beach to the West End or take a hike over the hill to Shelly Bay where we used to walk to in those early years. Left; my very first trip to Ohope Beach. I'm with my parents and Grandmother. 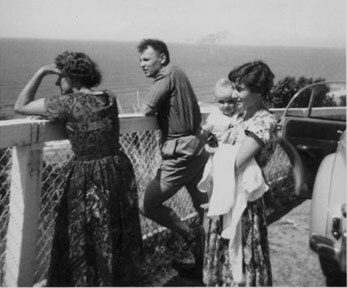 As Life moved on my Sister, Brother & I made separate plans over the Christmas breaks and the time had passed for our regular caravan holidays at Ohope Beach. Now that Michelle & I live half way down the South Island we are too far away to contemplate summer holidays of our own at this awesome place, where the sun always seems to shine and the water is clear and warm. When Dad’s eightieth birthday came around in April 2008, he chose to celebrate at Ohope beach. The now extended family booked a motel at the West end…right on the very spot that Mrs Brown’s units were when we used to holiday in those very early years. This presented an opportunity for me to look for material for a painting or two that might connect with many memories. As well as enjoying that very original place on the shore, I made a point of taking my daily run up the beach, past the site of the old motor camp, which is now a sub - division. Each time I went by, I pictured where our caravan and those of friends used to be. ‘West End, Ohope Beach’, the first oil painting to result from this 2008 trip, is unmistakably Ohope beach. The telltale landmark is Moutohora, commonly known as Whale Island. In some respects, the gulls in the painting probably aren’t dissimilar to the families at the motor camp all those years ago, congregated socially in their regular positions. Original painting size:1500mm x 700mm $NZ 12,500 + freight & packaging.